Shopping: It’s a learning experience. Lancome has a line of cosmetics with Braille labels. A woman can never have too many shoes. Malls are still — well, malls. I’m wearing the wrong size bra (no, you don’t need any more). Jeans are just as hard for La Petite to find as they are for me, several sizes larger. I’m still an amazing bargain shopper. Even the cashier was impressed. Peanut noodles are delicious. I wonder if I could make this dish? Fortune cookies can be ridiculous. Hallelujah? Really? I followed up a day of shopping with leftovers for supper and a marathon of Tiny House shows. It was a nice, relaxing weekend, despite losing an hour’s sleep to Daylight Saving Time. Readers, do you enjoy retail therapy? Leave a comment. I didn’t cook in my slow cooker every day for a full year, but I did use it a lot leading up to and following Christmas. Tuesday saw bean soup with ham for supper. Thursday we had a classic – crock pot chili. Saturday night’s supper had a side dish of acorn squash cooked in the medium slow cooker. Sunday morning I experimented with overnight oatmeal, and Monday I tried out a breakfast bake for supper. No wonder I’ve worn out almost every slow cooker I’ve owned. The first lost the outer shell, the housing that provides heating element. One of its three feet broke off. After we threw away the broken parts, I tried planting herbs or flowers in the crock itself, but we couldn’t put holes in it for drainage (those crocks are tough). My second slow cooker lost not a foot, but a handle. I managed to use it very carefully for a little while, but eventually the outside was so worn I couldn’t even repair it with super glue. This slow cooker bit the dust as well. Confession: the blue crock from this one is still in the basement. It’s so pretty, I feel certain there will be a way to reuse it. The replacement for those two is still cooking – it made chili Christmas Eve. It’s wearing out, though, from the inside this time. I estimate I use either the large 6 quart crock or its 4 quart counterpart at least once a week. During tomato season, I can have several going all at once to simmer the fresh tomatoes down into a thick and delicious sauce. I’m considering Project Slow Cooker as a 2016 project. I own five (six, if you count the little dipper) in different sizes because we use them often in our busy lives. Once a week is normal. An increase to two or three times a week would be realistic. Aha, I think I’ve found a New Year’s resolution that is an attainable goal! Look for highlights of Project Slow Cooker here at Compost Happens. Now, readers. Do you take on new projects as the calendar changes to a new year? Share your inspiration in the comments. I keep trying. Wrapping paper, to me, resembles a single use plastic bag. 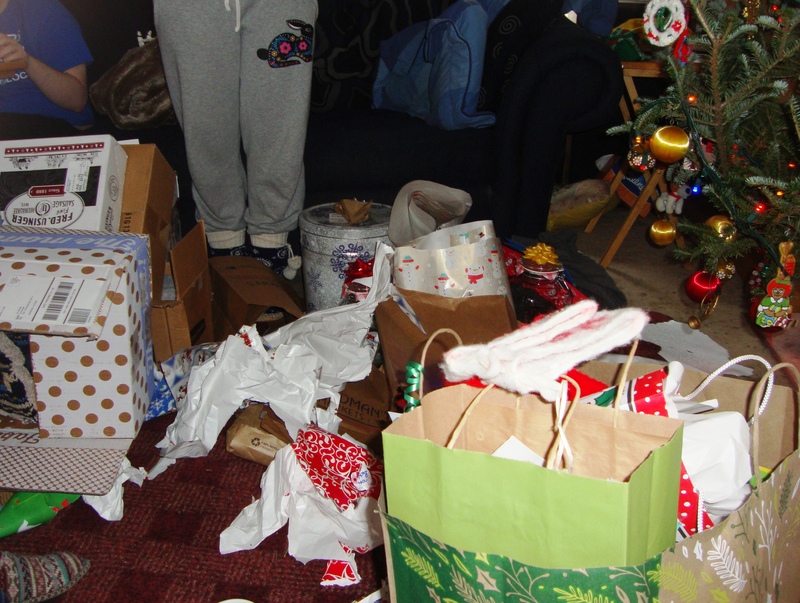 That is, wrapping paper is a waste of money and creates massive amounts of trash destined for landfills. Almost none of it is recycled or recyclable. Very little can be burned in a fireplace due to the chemical content. 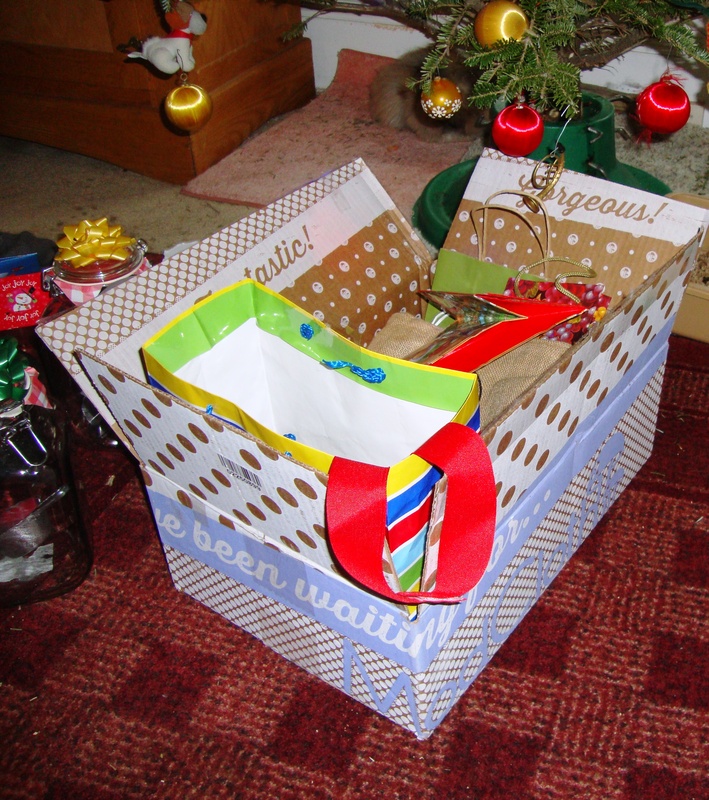 Unless it comes from a thrift store or the dollar aisle, wrapping paper is not cost effective, either. My family disagrees. This year, they took pleasure in making a mess of any wrapping paper they could. Their goal: prevent mom from saving big sheets of paper for reuse. Well, I did what I could. Given the sizable stacks of gifts, I can’t feel too bad. The stack of reusable tissue is almost as big as the bag destined for the garbage bin. I also managed to set aside this collection. Despite the family’s efforts to undermine my green goals, I managed to save more than we threw away. And that, my bloggy friends, is itself a gift. Ah, yes. It’s time to remind myself (as if I needed the reminder) of my personal rule: No New Wrapping Papers. I give in on ribbons, invisible tape, and a few other basics. But as for wrapping paper, I dig in my heels. First the disclosure: My home isn’t tiny. 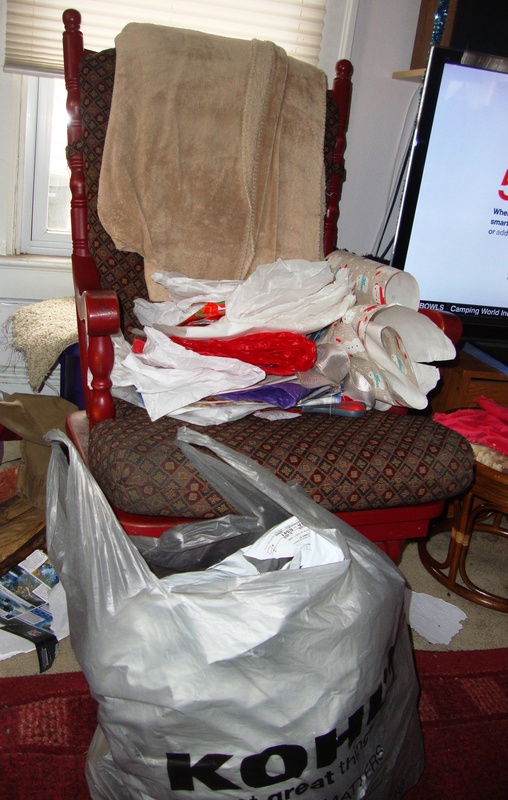 I’m not a pack rat, either – well, maybe I have some hoarder traits. All teachers do, it seems. I should take before and after pics, but I never seem to remember the “before”. I just reach a point where the closet is too full to be manageable and I know, I just know there is a lot of junk taking up space. Right now, it’s Amigo’s closet that’s pushing on my consciousness. His closet was the storage place for a while – the winter coats went there in the summer, the light jackets in the winter. But…of the coats in his closet right now, only one will come downstairs to the mudroom when snow flies. The others? It’s time to send them off to Goodwill. Amigo didn’t need space for hanging clothes for the longest time. But now, with his involvement in the local barbershop choir, he has a tux, a shiny gold sequined vest, dressy black pants, and two polo shirts with the barbershop logo on them. He needs space in his closet, and we do not need those old coats. Now that I’ve put that in writing, I can hold myself accountable for following through on this goal. If I’m honest with myself (which isn’t as easy as it sounds), I’ll admit that at least a few of those coats no longer fit anyone in the house. Maybe watching Tiny House Nation has done me some good. Random Shopping – it’s what we do. I went to the Farmers’ Market alone on Saturday because Chuck was dealing with the stone guys – the contractors finishing up our backyard patio. I came home with all this. Full disclosure: the squash cost $1 apiece. 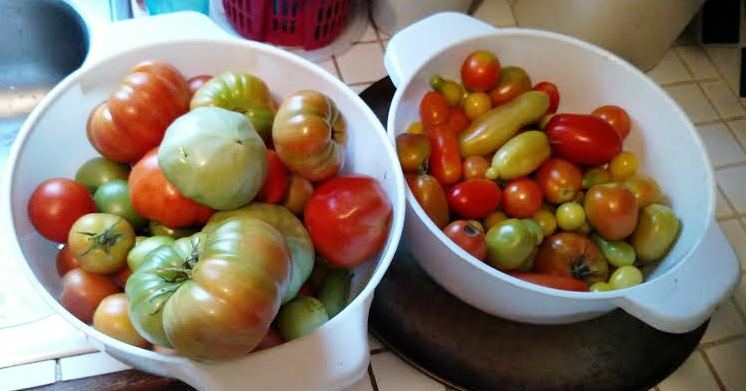 Yesterday I picked a couple of big bowls full of tomatoes, too. Oh, I forgot – carrots and parsnips and one stray turnip (no pics, sorry). And there are more on shelves in the other room. Then we visited the neighborhood meat market for a few things. We hadn’t had a real grocery trip for more than two weeks, so we needed a significant number of staples. Armed with three bags of meats and other local specialties, we started home and drove right past our street to follow the signs across the bridge and around the block to a garage sale. And OF COURSE we found some awesome buys. I quietly mentioned to Chuck that I would buy a few specific items if they weren’t, well, overpriced. He went right to work. Chuck: We’re interested in a few of your big ticket items, and we’d like to make an offer. Sale guy: You mean like a bundle? 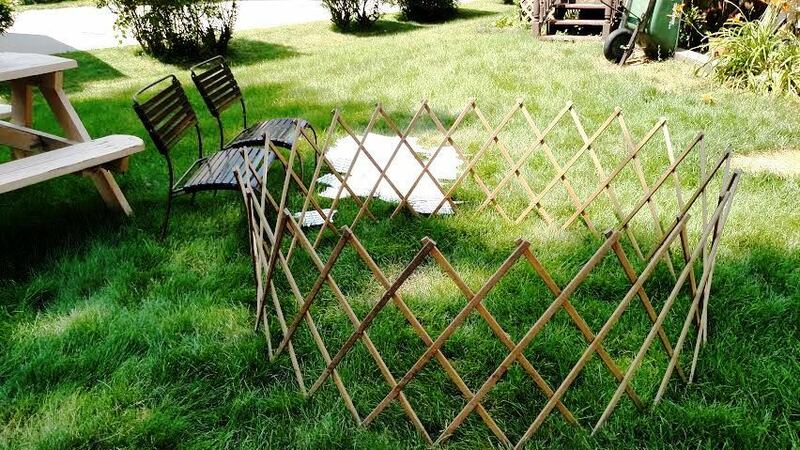 What do you think this is, American Pickers? Chuck: No, you don’t have the beard. Chuck: We’ll offer $13 for the whole bundle. Sale guy: I need to go inside and ask the “boss”. We paid $13 for a sturdy cart with drawer for the garage, a new-in-package blanket throw, and a big box of kitchen utensils. Saving money is exhausting. It’s a good thing I could relax and watch NFL football on Sunday. La Petite forgot to pack a few essentials last time she visited, so we headed to Kohl’s to take care of her needs and (of course) browse the clearance racks. My take-home was amazing. La Petite bought a few basics and a pair of shoes. I bought – well, you can see it here. I got an additional 20% off the sweater with the snag. Then, after adding it all up, I handed over my 30% discount coupon. My bag with its five items cost less than La Petite’s two. In fact, my bag full of new clothes cost about the same as the steaks I bought for supper at the meat market. They practically paid me to shop. Readers, have you had bargains so good you had to blog them? Leave a comment. I’d love to hear about yours. Beans! 3 pounds of beans. I started picking a few and then just kept on picking until the bowl was close to overflowing. 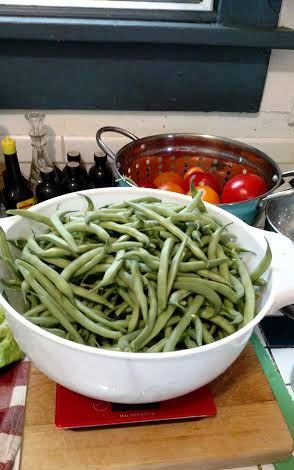 I weighed it on my tiny kitchen scale and found my first official bean harvest to measure just over 3 lb. Beans! All from my backyard kitchen garden! 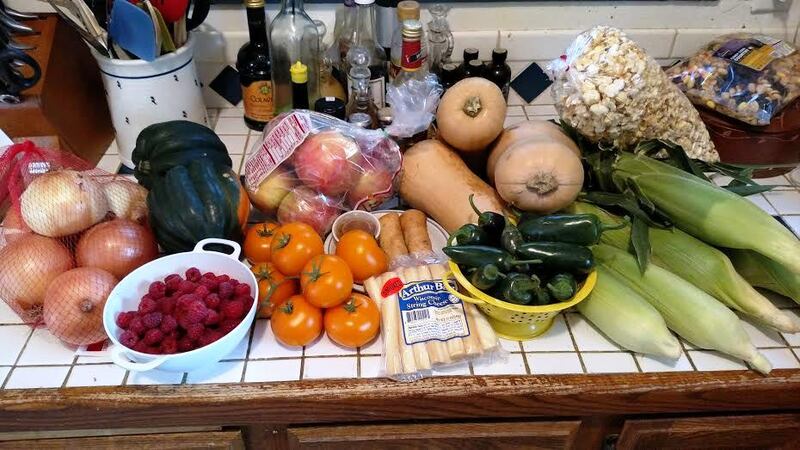 As for other clutter in the picture, the tomatoes were “scratch and dent” at the farmers’ market, and I wanted to make a scratch tomato sauce. Perfect. The odd looking green thing next to the cutting board is a lettuce cutter. This is from the market. There’s more outside, ripe for the picking – literally. 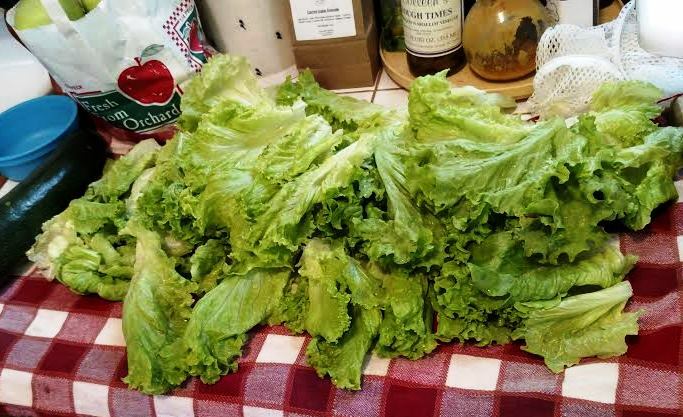 I picked about a pound of various lettuces Saturday; I smell BLTs in our future. For more Harvest Monday, visit Daphne’s Dandelions. She has all the links for a productive week in more ways than one. Note: Voter’s Voice will take its place on Tuesdays from here on out while I post my harvests on Mondays. Tomorrow: get reacquainted with Grandma Daisy, my alter-ego from the future who reflects oh so well on the past. 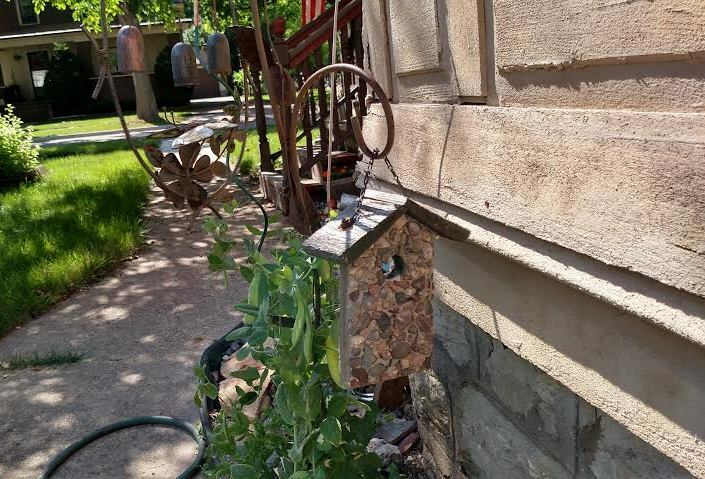 When I started my rock garden, it was a vehicle for covering and smothering the wild mint that was taking over the world. Several years later, I haven’t gone back to planting in the space – at least not in the ground. The stones and the rocks and the miscellaneous curiosities are growing in variety and quantity. 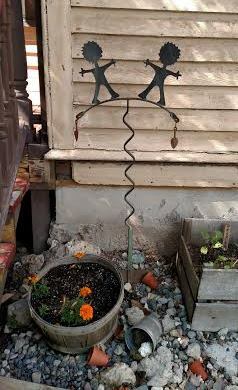 The peas climbing the shepherd’s crook are temporary. By next year, the mini mums will have taken over the space all the way over to the rocks. Fun – just cool and fun. This seemed to be a perfect addition to the space. 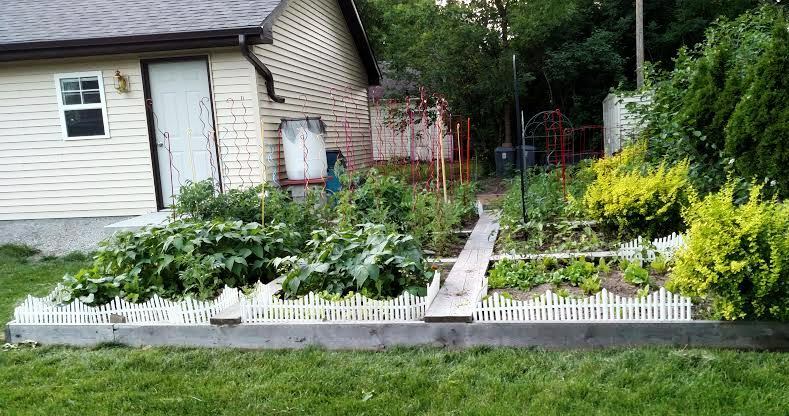 Maybe it’ll scare away the chipmunks that ate my spinach. The basil has outgrown its pots in the puppy. I’ll consider a transplant sometimes soon. 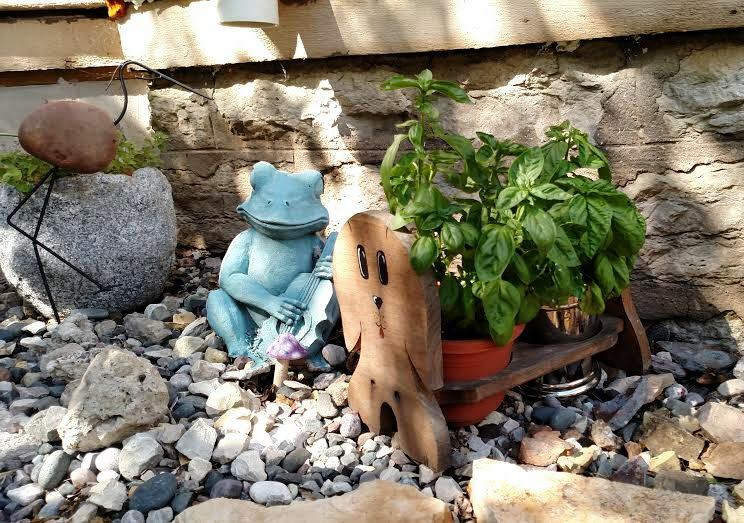 For now, the frog can entertain; plants grow better with music, don’t they?